When exploring nature, nothing’s quite like doing so on the water with its many beautiful scenic locations only accessible by boat. 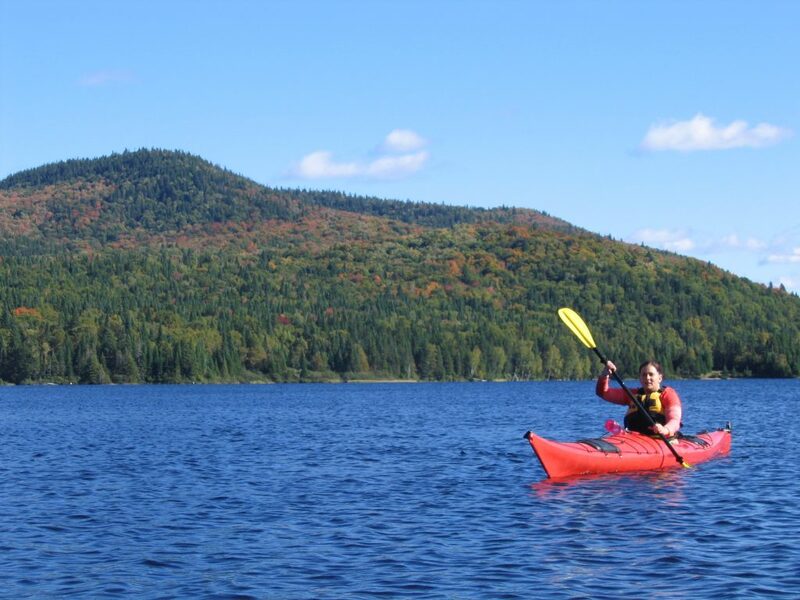 Whether cruising quiet lake inlets or calm coastal waterways, a kayak is an easy and inexpensive way to get there. For an outdoor enthusiast, there’s nothing more gratifying than you and nature on the open waterways. Kayaking is not an expensive sport like many people think, with a good beginner kayak starting around $200. 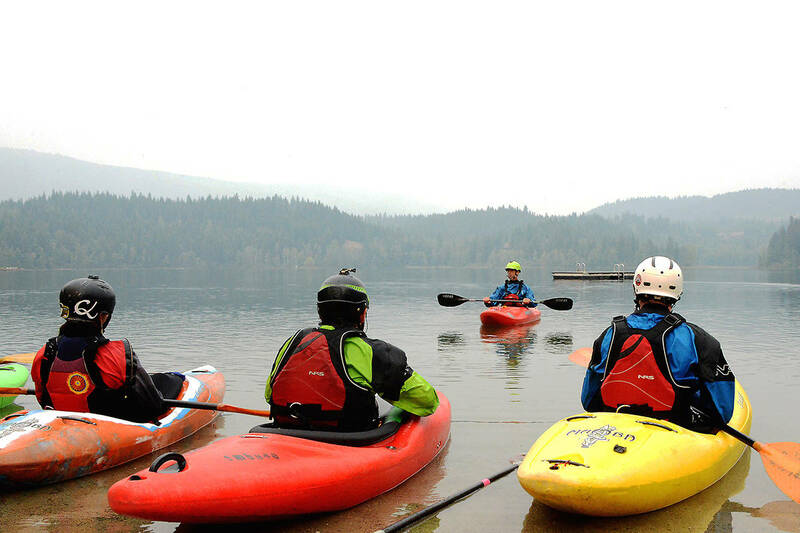 Next, if you want to learn how to kayak you will need to learn a few kayaking basics like kayak launching, paddling strokes, and getting back on shore. Once you’ve learned the basics, you’re ready for amazing adventures like overnight camping and kayaking or a river fishing excursion. Kayaking is a rewarding hobby that’s fun for the whole family. Your first step to beginner kayaking is buying or renting a kayak. Whether you choose to buy or rent, you must become familiar with the types of kayaks available. All four of these kayak types make a great beginner’s kayak. Here is a short definition of each kayak style. Recreational: Of the four choices, we consider the recreational the best for learning to kayak. 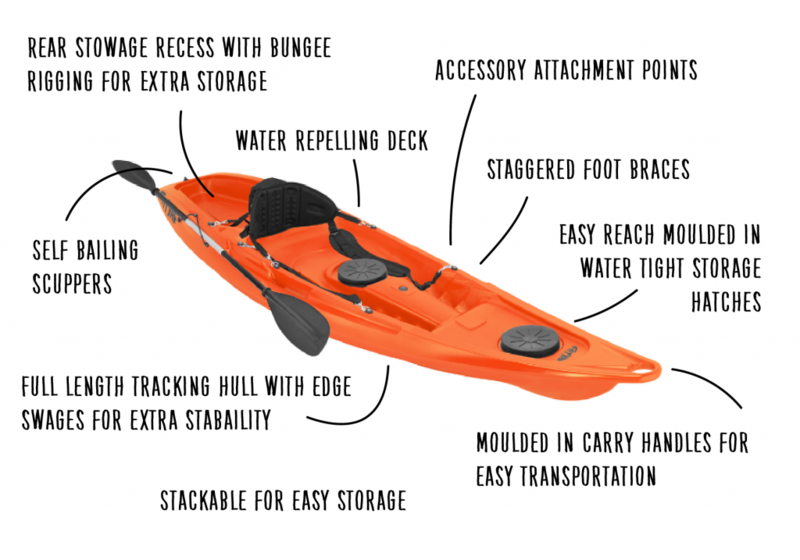 The wide and short build and easy maneuverability make the recreational kayak a perfect general use beginner vessel. Inflatable: Coming in as the least expensive of the beginner’s kayak is the inflatable kayak. Inflatable kayaks fall under the category of a sit-on-top, giving you a cheap solution for learning to kayak. Despite beach balls and toys coming to mind when you think of inflatable, these kayaks are very durable. However, these boats don’t move as well as a hard body kayak and take more work to paddle. Sit-On-Top: The sit-on-top is just like it sounds, the seat is on top of the kayak instead of down inside. These kayaks lean toward the slow wide and stable side, making them easier to maneuver and great on calm waters. The SOT work well for learning how to kayak. The only downside is they’re better suited for warm climates. Touring: Also called a sea kayak, the touring kayak is a long trip boat. Narrow, long and harder to turn than a recreational kayak, the touring kayak is better for straight paddling. The touring kayak has lots of storage for supplies and gear making them a good choice for longer trips. Now that you understand the types of kayaks best for learning, you may want to know how much to spend. When shopping online, you’ll see many boats for sale in the range of $200 to $400. If you buy a used kayak, you might find one for less than $200. You may wonder if these cheap kayaks are worth buying. It looks like a great deal but is a $200 kayak such a great buy? The answer is, it depends on how you’ll use the kayak. If you plan using it to learn kayaking only, a cheap kayak might be the answer. But, if you want a kayak that goes beyond the beginner kayaking stage, you may want a better boat. Regardless whether you spend $200 or $2,000, you want a kayak made of high-quality, durable material. Your new kayak must handle repeated use and the bumps and dings from learning how to do kayaking. If you’re looking for a recreational sit-in kayak, we urge you to spend the extra for a high-quality vessel. Cheap recreational sit-in kayaks don’t have an aft or forward bulkhead which is a big safety issue. 1. Bulkheads keep the kayak cockpit from flooding. 2. Bulkheads help you turn the kayak over if it capsizes. No bulkhead and your kayak sinks. 3. If you take on water, bulkheads help you make it back to shore before emptying the water. 4. Kayaks with two bulkheads may keep all or part of the kayak above water when flooded. An inexpensive sit-in kayak isn’t useless, but using safely is limited, and the best use is floating next to shore. Wherever you use a cheap sit-in, you need a place you can reach the shoreline. If you paddle farther out, you should be a strong swimmer and able to reach the shore easily. Bottom line, a cheap kayak works well for close to shore excursions in calm waters. 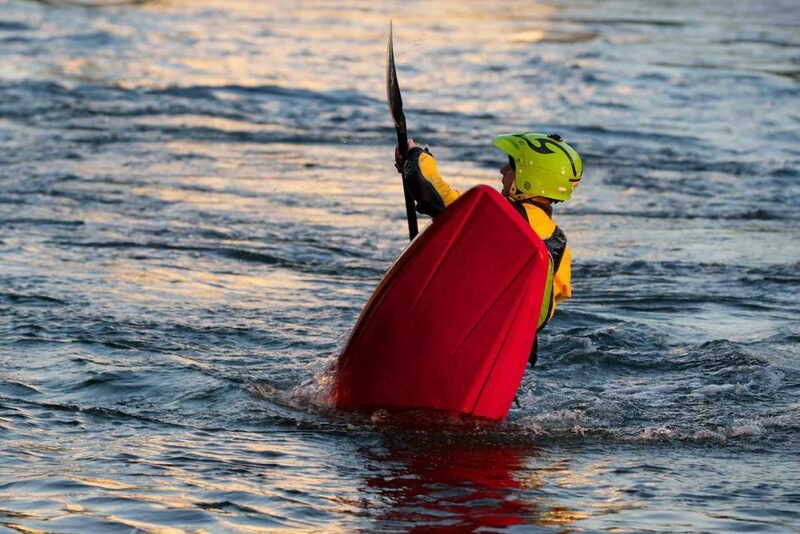 If you plan trips on swifter currents or rapids, stay away from a cheap sit-in kayak. Look for a sit-in kayak that’s high-quality with one bulkhead, but two is better or use a sit-on-top model. When you hear kayak clothing, the first thought is dressing for weather conditions. But, thinking about water temperature is the correct answer since you will get wet. To stay warm in colder waters, you need to consider three clothing layers. Other clothing considerations include quality socks or footwear, gloves, hat, and sunscreen. If you live in a warm climate, all this clothing isn’t necessary so dress according to your area. Until you gain some experience, you need to make careful consideration of your kayaking location. The last thing a new kayaker needs is waters that have strong waves or currents. For learning, you need calm flat lake or pond waters. Stay away from white water or ocean currents until you develop your skills and have a few excursions under your belt. If you don’t have either of those water bodies for learning, a slow-moving river or stream is a good second choice. There are several steps to follow when you learn how to kayak. In our step-by-step guide, we show you the best kayaking techniques for beginners. Once you read our guide, you’ll understand how to use a kayak and find some great kayaking tips and techniques. How to start kayaking begins with launching your kayak and how the shoreline shape plays a role in the launch. There are two types of shoreline shapes affecting kayak launching, a gentle slope into the water and a steep slope. Gentle slope: The easiest launch condition, the gently sloping incline lets you easily slide your kayak into the water. Point your bow in the direction of the water, running perpendicular to the shoreline. Climb on the kayak then using your hands, push away from the shoreline. When the boat glides out on the water, begin paddling. Steep or rocky shore: The steep descent or rocky shoreline adds more difficulty to the launching process. In this case, you must put the kayak in the water running parallel to the shoreline. 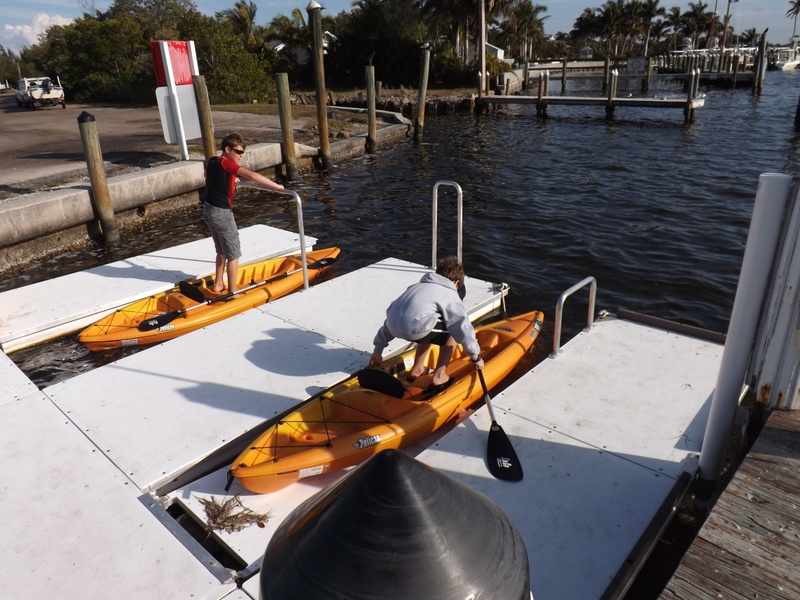 Put your paddle behind the kayak seat, perpendicular to the shoreline, using it to brace and hold the boat in place. Climb on the kayak, adding pressure to the paddle to keep the boat steady. Position yourself comfortably and begin paddling. Until you get a feel for the paddling techniques, start learning how to paddle a kayak in the flat water. You also want to learn the difference in paddles and which ones best suit your needs. Picking the right paddle makes a difference between a rewarding and fun experience or painful shoulders and hands. Understanding the different paddle types is critical to learning how to paddle in a kayak. Look for a paddle with square blades for learning before moving to an offset or feathered paddle. 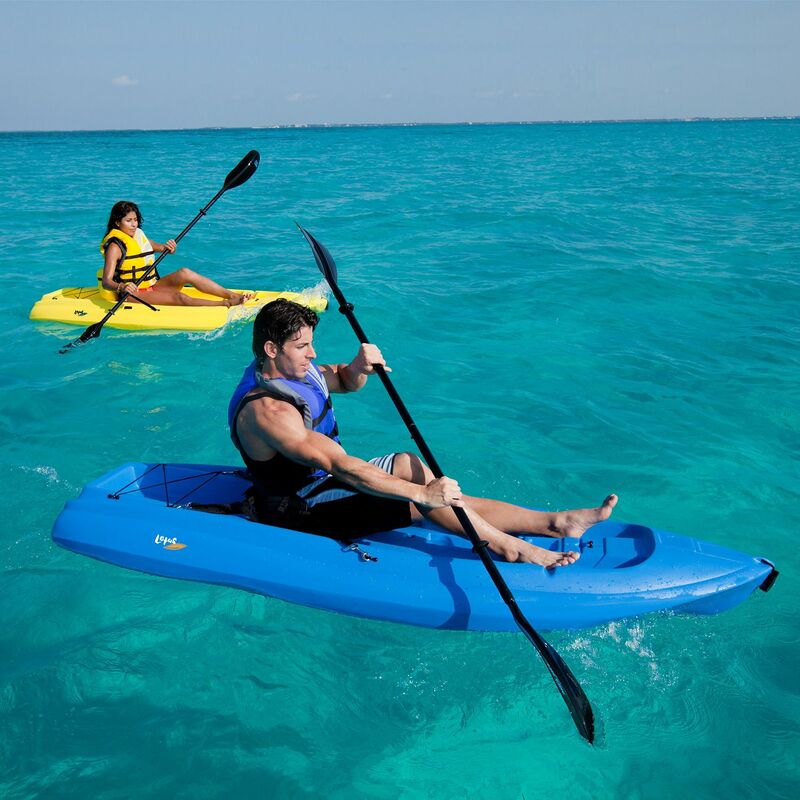 Recreational kayaks which are the recommended beginner kayak have a width of 26-inches to 30-inches. Wider boats require longer paddles of 86-inches to 90-inches. A touring kayak, our second recommendation for a beginner kayak, has a narrower hull and takes a shorter paddle. With an overall kayak width of 22-inches to 25-inches, a shorter paddle works well. When paddling, learn to keep your hands relaxed. You don’t need a vice-like grip to move your kayak. You need good posture with your torso vertical and feet placed in a footrest, with knees bent slightly. This posture lets you use your whole torso and shoulders and not just your arms. Start your paddling sessions slow and easy until you get a feel for the steering and paddling strokes. The basic forward stroke is straightforward, but some tips help make learning easier. When moving forward, keep the paddle close to your kayak. By bringing it down and away from the kayak sides, your boat turns. When paddling, twist your torso to increase the power of your strokes. Push with the legs while paddling for adding extra strength to your strokes. With any paddling stroke, use the strong leg and torso muscles for propelling you along. By only using the arms, you use more energy to move the kayak which tires you out quickly. Relax your upper arms and don’t use a tight grip on the paddle. A looser grip keeps the stress off the arm muscles while the full body pushes the kayak forward. Keep your body seated in a way that you don’t shift your weight too much while paddling the kayak. The basic reverse stroke, for backing up the kayak, is the forward stroke done in the opposite direction. The kayak turns with a sweep stroke, which you use with either forward or backward strokes. A forward sweep stroke turns your kayak left or counterclockwise and a reverse sweep turns the opposite direction. Start the forward sweep by keeping the paddle lower than your shoulders. The stroke begins at the front and right of the kayak seat. Instead of pulling the paddle straight back, you move the paddle in an arc around to the back. Move the paddle in an arc while you twist the body torso at the same time. The movement of the forward sweep should move the kayak counterclockwise. If you need your kayak turned right or clockwise, the movement is the same with one difference. For the opposite turn, you simply bring the paddle down on the left of the kayak. The sculling draw stroke lets you move the kayak sideways. Sculling helps you approach another boat or a dock. For the sculling draw stroke, start by holding your paddle against the kayak side. You want your paddle on the same side of your target destination. By holding your hands over the water, insert the paddle into the water at a steep angle. You want the leading blade edge of the paddle angled away from the kayak when pushing the paddle blade forward. When ending the stroke, turn the paddle over so the blade edge of the paddle angles away from your kayak. Pull back the paddle and repeat to continue moving sideways. If you capsize your kayak while paddling, you must know how to roll in the water to get it back in an upright position. Purposely rolling your kayak is scary, but it’s important you know how to turn back over after capsizing. Most rolling techniques begin with the paddle blade sweeping over the water surface before strike downwards vertically. Once you gain experience, you can successfully roll with only a sweep or a strike phase. While the roll isn’t a difficult kayaking maneuver, we do suggest learning in a swimming pool if possible. Only one blade does the work when rolling, and it’s called the active blade. Begin with your blade on the water surface near one end of the kayak which is your starting position. Let it skim the surface, away from the kayak. The movement is like water skis, causing your kayak to roll on its side. The move brings the body up part-way until the head floats right below the water surface. Bring the blade as far away from the kayak side as possible in the strike position and bring it down vertically. When the water resists the downward strike, it gives enough support for you to sit in an upright position. The paddle strike works like a support stroke. It’s important you get the timing right when striking or the paddle blade will sink. When the blade reaches 18-inches below the surface, you lose support. Your blade can sink to that point in under a second, so timing is essential. A hip snap helps with the support stroke and simply ensures you have the kayak flat and level before rising. Coming from the off-balance position, smoothly roll the hips while bringing the kayak upright. You want the kayak back level and flat and your body following the kayak a second later. There are two other basic skills every beginner needs to learn about how to kayak safely, the scramble and exit. Getting thrown from a kayak, especially when learning the roll, can happen. When you need back on the kayak fast, you need the scramble maneuver. Start with flipping the kayak right-side up then swimming to the stern side. Pull yourself up by using a motion like getting out of a swimming pool. Throw a leg over the kayak until you straddle it. Carefully inch forward until you get your legs back inside and can get seated. Landing the kayak is identical to launching it only with the steps reversed. Whether you exit at a dock, a gentle slope, or a rocky incline, the exit technique is the same. Position the kayak paddle perpendicular to the shoreline and the kayak. Use the paddle for support while climbing out of the boat. Kayaking is a reasonably easy sport to learn. However, kayaking isn’t just about purchasing the boat and heading to the water. It takes practice and a good knowledge of all the kayaking safety precautions and maneuvers. By not taking the time to learn about safe kayak operations, you might find yourself in a dangerous situation. We highly recommend considering some professional training, at least with the important rolling maneuver. Until you gain skill and experience, never kayak alone especially if you plan on practicing your rolling technique. In the beginning, you need a buddy along to keep you safe. Rolling with your kayak under water can easily cause panic in even the strongest swimmers. 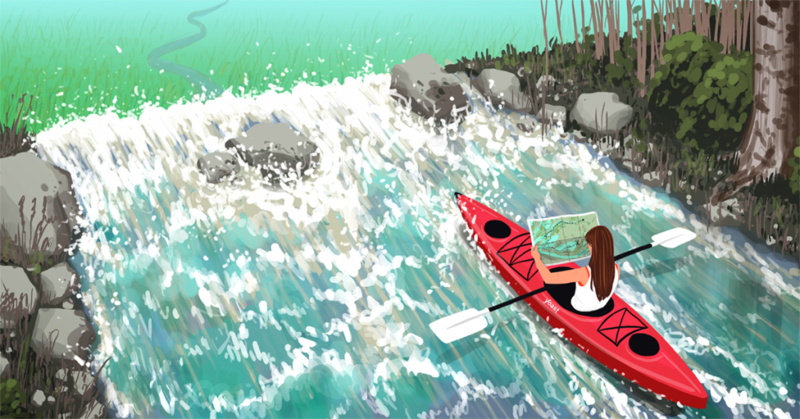 Even if you master the basic strokes, it doesn’t mean you’re ready to go on a long kayaking adventure. You also need an understanding of evasive emergency actions and maneuvers. Knowing how to rescue other paddlers or rowers is as important as learning how to rescue yourself. Make all your kayaking excursions on calm, flat waters until you gain skills and experience. Leave the rapid rivers and choppy ocean waters until you have the skills needed for rougher waters. As we mentioned earlier in the article, what clothes you wear while paddling is an important safety consideration. If you live in cold climates or areas that have a short warm season, the water never gets warm, and the air may stay cool. While wearing heavy cotton protects you against a cold wind, remember you’re in a kayak, and you won’t stay dry. When that heavy cotton starts soaking up the cold lake water, your body temperature starts dropping dangerously low. Once your body temperature drops from 98.6° Fahrenheit to below 95° Fahrenheit, hypothermia begins. If you paddle in cold water, always follow the three-layer clothing rule: moisture control, insulation, water and wind protection. In colder waters at 60° or less, a condition known as cold water shock begins. Different from hypothermia, cold water shock results in death shortly after falling in the water. Kayaking in water this cold always requires wearing a wet or dry suit. A lifejacket is important for anyone, especially weaker swimmers. But when kayaking in water 60° Fahrenheit and colder, all paddlers need a lifejacket. Even for experienced kayakers, there’s always a good chance of capsizing. Always stay visible to other kayakers and larger boats sharing the same waterway. Wear bright clothing that stands out and makes you easy to find if an emergency arises. Consider adding reflective patches or tape to your boat, kayak seat back, and paddle blades. Make a whistle a standard part of your emergency gear. Now that you have the kayak basics it’s time for some tips and tricks for making your kayaking easier. We recommend beginning kayakers start with square bladed paddles. The square shape makes learning easier. As you gain your kayaking skills, you may find yourself switching to the offset paddles most experienced kayakers prefer. Most kayaks include deck lines already attached. You need to learn the different styles of knots for making good use of this feature. If you’re on a camping trip and you need to check your surroundings, do so when you have a clear view. While it’s still daylight, scan the area and get a good view of the next day’s planned paddling route. Be sure you take a compass reading and write it down so if you have a foggy morning; you at least have a directional heading. Add to your gear list large binoculars. While smaller binoculars are compact and lightweight, they don’t have as good of viewing capabilities. When you bob around on the water, smaller binoculars make seeing through them more difficult. Finally, we come to the mistakes new kayakers make. By avoiding these mistakes, you get a fun and relaxing adventure. A good kayaking experience starts with good paddling posture which includes using the full body for controlling your kayak. Many beginners neglect using the foot supports and backrest. When not seated properly you can’t leverage your torso and leg power for helping you paddle and keep your kayak sitting upright. Paddle hugging is another common posture mistake made by new kayakers. The paddle hugging position involves excessively bending the elbows and holding the paddle too close to the body. This position locks the shoulders against the torso. While paddle hugging might feel like good control, it makes no difference at all. It does, however, tire you out and sets you up for painful injuries. 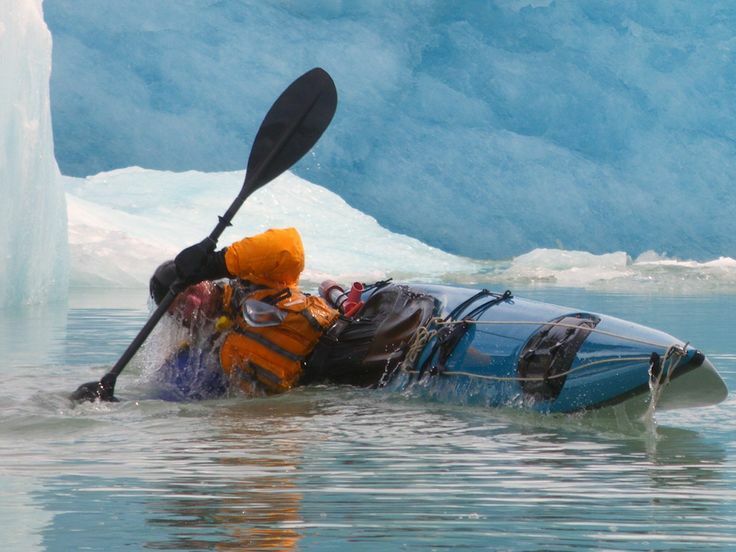 Collisions happen to the best kayakers, but how you handle the collision course makes a difference in how you come out of it. The first reaction to an impending collision is leaning away from the obstacle. Leaning away is the wrong move and can cause your kayak to turn over. When confronting a collision, always lean toward the obstacles and shield yourself with your arms. Another instinctive move comes when your kayak is sideways in a river. Most beginner kayakers lean upstream as they try to right the boat. However, this is wrong and can cause you to capsize. When facing sideways, always lean downstream until you gain control. Another common mistake for beginning paddlers is holding the paddle upside down and backward. Not having the paddle in the right position reduces your kayak stroke power. At first look, you may wonder how you know if the paddle faces the correct direction. The first and easiest clue to correct paddle position is the words on the paddle blade. If you can read the words from left to right, your paddle faces the right direction. If your paddle doesn’t have words on it, look at the shape of the paddle blade. The blade top is flatter and longer while the blade bottom is tapered and more angled. When holding the kayak paddle, the blade should curve toward you. If the blade is curving away from you, you have the paddle backward. If you enjoy hiking, camping, fishing, or just spending quality time with friends and family you should consider kayaking. This water sport gives you a chance to explore places you never thought possible!